TH E M R EP O RT | 51 O R I G I NAT I O N S E R V I C I N G A NA LY T I C S S E C O N DA R Y M A R K E T ANALYTICS THE LATEST Rising Regulations Mean Rising Prices Government regulations are pricing 14 million households out of the market. 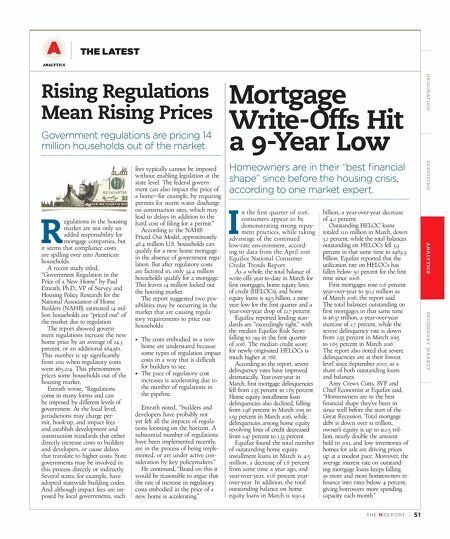 R egulations in the housing market are not only an added responsibility for mortgage companies, but it seems that compliance costs are spilling over into American households. 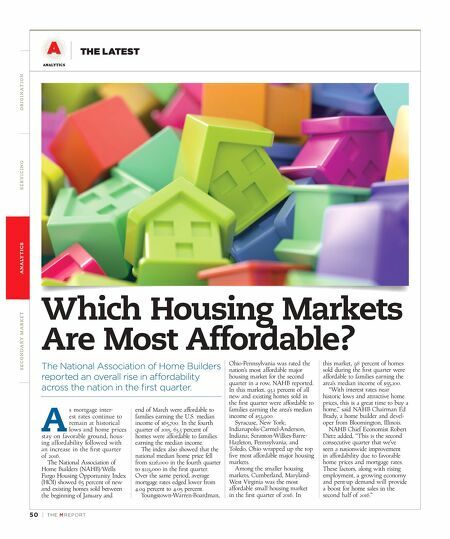 A recent study titled, "Government Regulation in the Price of a New Home" by Paul Emrath, Ph.D., VP of Survey and Housing Policy Research for the National Association of Home Builders (NAHB), estimated 14 mil- lion households are "priced out" of the market due to regulation. The report showed govern- ment regulations increase the new home price by an average of 24.3 percent, or an additional $84,561. This number is up significantly from 2011 when regulatory costs were $65,224. This phenomenon prices some households out of the housing market. Emrath wrote, "Regulations come in many forms and can be imposed by different levels of government. At the local level, jurisdictions may charge per - mit, hook-up, and impact fees and establish development and construction standards that either directly increase costs to builders and developers, or cause delays that translate to higher costs. State governments may be involved in this process directly or indirectly. Several states, for example, have adopted statewide building codes. And although impact fees are im - posed by local governments, such fees typically cannot be imposed without enabling legislation at the state level. The federal govern- ment can also impact the price of a home—for example, by requiring permits for storm water discharge on construction sites, which may lead to delays in addition to the hard cost of filing for a permit." According to the NAHB Priced Out Model, approximately 48.4 million U.S. households can qualify for a new home mortgage in the absence of government regu - lation. But after regulatory costs are factored in, only 34.4 million households qualify for a mortgage. This leaves 14 million locked out the housing market. The report suggested two pos - sibilities may be occurring in the market that are causing regula- tory requirements to price out households: • The costs embodied in a new home are understated because some types of regulation impact costs in a way that is difficult for builders to see. • The pace of regulatory cost increases is accelerating due to the number of regulations in the pipeline. Emrath noted, "builders and developers have probably not yet felt all the impacts of regula - tions looming on the horizon. A substantial number of regulations have been implemented recently, are in the process of being imple - mented, or are under active con- sideration by key policymakers." He continued, "Based on this it would be reasonable to argue that the rate of increase in regulatory costs embodied in the price of a new home is accelerating." Mortgage Write-Offs Hit a 9-Year Low Homeowners are in their "best financial shape" since before the housing crisis, according to one market expert. I n the first quarter of 2016, consumers appear to be demonstrating strong repay- ment practices, while taking advantage of the continued low-rate environment, accord- ing to data from the April 2016 Equifax National Consumer Credit Trends Report. As a whole, the total balance of write-offs year-to-date in March for first mortgages, home equity lines of credit (HELOCs), and home equity loans is $9.5 billion, a nine- year low for the first quarter and a year-over-year drop of 22.7 percent. Equifax reported lending stan - dards are "exceedingly tight," with the median Equifax Risk Score falling to 749 in the first quarter of 2016. The median credit score for newly originated HELOCs is much higher at 788. According to the report, severe delinquency rates have improved dramatically. Year-over-year in March, first mortgage delinquencies fell from 2.35 percent to 1.65 percent. Home equity installment loan delinquencies also declined, falling from 1.98 percent in March 2015 to 1.59 percent in March 2016, while delinquencies among home equity revolving lines of credit decreased from 1.47 percent to 1.33 percent. Equifax found the total number of outstanding home equity installment loans in March is 4.5 million, a decrease of 1.8 percent from same time a year ago, and year-over-year, 10.6 percent year- over-year. In addition, the total outstanding balance on home equity loans in March is $130.4 billion, a year-over-year decrease of 4.2 percent. Outstanding HELOC loans totaled 11.0 million in March, down 3.2 percent, while the total balances outstanding on HELOCs fell 3.9 percent in that same time to $489.9 billion. Equifax reported that the utilization rate on HELOCs has fallen below 50 percent for the first time since 2008. First mortgages rose 0.6 percent year-over-year to 50.2 million as of March 2016, the report said. The total balances outstanding on first mortgages in that same time is $8.37 trillion, a year-over-year increase of 2.7 percent, while the severe delinquency rate is down from 2.35 percent in March 2015 to 1.65 percent in March 2016. The report also noted that severe delinquencies are at their lowest level since September 2007, as a share of both outstanding loans and balances. Amy Crews Cutts, SVP and Chief Economist at Equifax said, "Homeowners are in the best financial shape they've been in since well before the start of the Great Recession. Total mortgage debt is down over $1 trillion, owner's equity is up to $12.5 tril - lion, nearly double the amount held in 2011, and low inventories of homes for sale are driving prices up at a modest pace. Moreover, the average interest rate on outstand - ing mortgage loans keeps falling as more and more homeowners re- finance into rates below 4 percent, giving borrowers more spending capacity each month."